Well for this desert peaks trip, I had three of us signed up to go, Matt Haynes, John Paterson and myself. John and I hooked up for our carpool from Rancho Bernardo on Friday night and took off to meet Matt at the trailhead, which is about 14-15 miles northwest of Vidal Junction. Folks, these peaks are WAY out there in terms of distance and the time to get there. One can get to Lone Pine in that distance. Thanks to the assistance of John's GPS, we found the correct dirt road turn off which was north on U.S. highway 95 approximately 12.1 miles from Vidal Junction. We were close to the Arizona border. Anyway, we got to the trailhead to park and crash there for the rest of the evening close to midnight. Matt was there too which was good news. We could see the ominous dark outlines of our two objectives in the lower horizon of the starry skies, Umpah Point on the left and Mopah Peak on the right. We were also greeted by some cold winds at our bivouac site. We got up on Saturday morning and sorted out a light rack to take, along with harnesses,slings, carabiners and a 50 meter 9 mm rope. The wind was stronger but at least it was sunny. We started off at 7:40 AM for our first objective, Umpah. 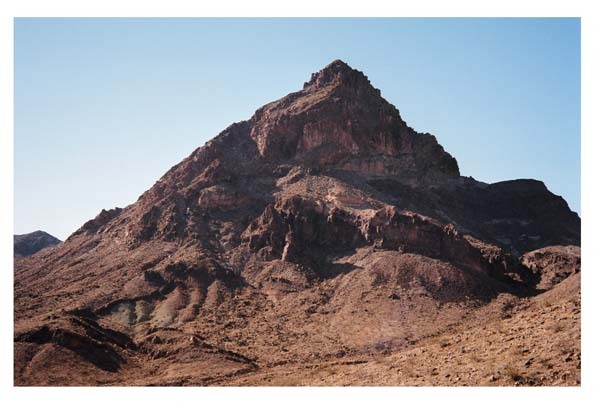 According to Andy Zdon's book, Desert Summits, he describes the direct east ridge on the peak as being class 3-4 and nothing else. This is the route we planned to do. So we hiked up a jeep road which turne into a wash which we followed to the west. One can see both peaks, Umpah and Mopah from one spot in the wash. Both are spectacular looking, especially Mopah. We left the wash and headed in a southerly direction down and up through more washes traversing the desert landscape, enroute we got a good look at the east face of Mopah for Sunday's climb. We could also see the east ridge of Umpah to the south. We kept moving through the turbulent wind and a few more washes and hiked up to the base of the east ridge by about 10:30 AM. We put on our helmets and climbed up the route. The base of the east ridge route starts on the left side of a knife edged ridge up a class 1-2 gully which was fairly wide. Further up, we encounterd a small pseudo-headwall which had several easy class 4 moves. Above that we moved slightly to the left, into another gully which had some class 2-3 rock in it, and was a bit loose. I was using some yellow surveyor's tape, tied off to bushes here and there as we went up, for the return trip down the peak. The wind seemed to be gusting badly at times during our climb. We continued up the gully and went over a rib to the right and continued climbing up another gully which brought us to the crux of the climb. We encountered another headwall which appeared to be class 4 to possibly 5.2. John and Matt had climbed up ahead of me, they went to the left of the headwall where there was a chimney. This chimney is near and to the right side of a block shaped pinnacle. To get up the chimney, which was two easy class 4 moves and then we had to stand on a narrow block and move up several moves up the rock. I looked at both options and yelled up to John and Matt for a belay. My hands were cold from the wind and being in the shade also did not help my psyche. They set up a belay anchor and while they were doing that, I put on my harness. The rope was tossed down to me and I tied in to my harness got an affirmative that I was on belay and started climbing. I reached John at the belay station. To my relief, the summit was about 100 feet in elevation above us. Matt had climbed up toward the summit. I stayed on belay and pulled out the rack and moved over to the right and went up about 10 feet of class 3 rock and put in one stopper. Difficult to get in any descent protection so I kept climbing. I moved over to the left up a ramp and found a solid rock on the ramp where I could wedge myself into a solid belay position. I belayed John up to this station and from here the terrain did not need to be climbed roped. We traversed over to the left from the last belay station. It was mostly class 1-2 travel with several class 3 moves over a few boulders and on up to the summit. Matt was there on the top and John and I joined him there. It was about 1:00PM and the wind was really blowing with a couple of stronger gusts, one which knocked me off balance. The view was pretty nice anyway with a great view of Mopah's spectacular south face and Castle rock to the southwest.. We did not linger on the summit for too long, just long enough to sign the register have a snack and to take a few photos. The last party to sign the register was during April of last year. It looked like the peak was climbed about once a year. We started descending and I left the summit at about 1:30 PM. Matt set up a belay anchor at the ramp/belay station and I downclimbed on belay down the class 3 rock and past the chimney crux section. John followed on belay as well and Matt came down unroped. This section here had some loose rock in it so we had to be even more careful on the descent by staying at the sides of gully below the chimney. We retraced our steps for the most part picking the yellow tape that I had placed for our descent. Somehow, we managed to avoid the class 4 headwall down below by turning to the left into a gully above it. We kept descending and got down to the base of the route and retraced our steps on our approach to Umpah. It was 3:00PM by the time we got to the east side of Mopah and there was not enough time to climb that one on that day. We continued back down to the large wash and hiked out to the cars by about 5:15 PM. I figured we had traveled about 11 miles round trip and gained about 2,300 feet. For happy hour, John had some Trader Joe's blue tortilla chips and spicy black bean dip which was quite good. We decided that we were going to go try going to the cafe in Vidal Junction for dinner. Later, we found that it was closed so we went to Pizza Hut in Parker, Arizona for a well deserved pizza dinner. Matt had spaghetti and meat sauce. It was windy and cold when we were at the trailhead so I got some hot coffee since I had a chill. After dinner we returned back to the trailhead to crash for the evening so we could be rested up for the climb of Mopah on Sunday. We got up the next morning and cast off for Mopah at about 7:45 AM. The wind from the Santa Ana conditions had died down and it was sunny and not too warm. It looked like very good weather for climbing. We continued with the same approach that we used for Umpah yeasterday by going up the same wash, and in about two hours we were below the east face of Mopah, which is a spectacular looking peak especialy when viewin it from the north and south sides. 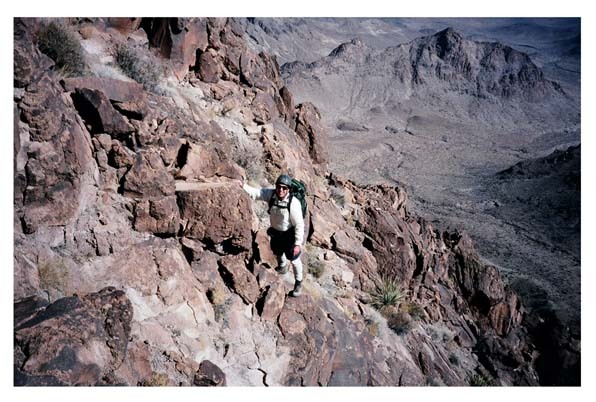 The route description that is given in Andy Zdon's book, Desert Summits, is fairly accurate to what we encountered on the climb. We looked for the first notch and headed south to it which was really a very small saddle than a notch, which was the same for the second "notch" also. We climbed up to this and continued up a very wide gully, watch out for cat's claw here, and headed straight to an obvious headwall. At the headwall, we turned to the right and found the small cave that was underneath an overhanging wall of rock. We climbed to the cave and from here it is a 25 foot traverse to the right that brought us up to a patch of class 3 rock which we zig-zagged up to a very narrow chute/chimney. This feature was fairly steep and exposed and was mostly class 3 with a couple of class 4 moves just below the notch, which was so narrow I had to take off my pack to get through it. I asked for a belay from John to get over the last couple of class 4 moves to the notch and to get through it. From the notch, we descended 10 feet in elevation to get down to a ledge. From this ledge we easily saw the section of rock that is class 3-4. Matt and John set up a belay anchor here at this ledge/alcove type feature. Matt tied into the rope and started his lead and made about a 15 foot traverse to the class 3-4 section of volcanic rock. He went up the really steep section of rock, which was only about an 6 foot section of it which goes straight up to a very low angled ledge. Matt went up the ledge about 30 feet and set up another anchor, so he set up a fixed line. John tied a Kleimheist into the fixed line and climbed across and up the steep section of rock. After he had climbed up to the second anchor and untied, I tied into the fixed line with a Keimheist and started the traverse up to the very short steep section of rock. I thought it was definitely class 4, but it was really not crumbly at all as discussed in the guidebook. This was really the crux of the climb which required combinations of face climbing and edging technique. I got up the ledge to the second anchor, an untied from the line. I climbed up some loose gentle slope up to the summit to meet John and Matt. From the summit, we had a tremendous view of the spectacular Umpah Point, that we climbed yesterday. Off to the SW was the imposing lookin Castle Rock which did resemble a castle. Just to the NW we could see an small grove of palm trees which was a possible oasis. To the east we could see out to Arizona, Lake Mojave and the Colorado River. The temperature on top was quite nice, probably in the low 70s, and it was still with no wind. Quite a different scenario than our experience on Umpah yesterday. It was really quite pleasant, so we stayed for about 20 minutes and had a snack and signed in on the register. It looked like Mopah ahd more activity on it, 8-10 parties per year. We left the summit and downclimbed our fixed line back to the alcove/ledge feature. We retraced our steps, and I got a belay from John for the downclimb from the notch down the chute/chimney to the class 3 rock section that was just above and to the left of the first cave. John took a belay from Matt to this same spot and Matt downclimbed from the notch and instead of zig-zagging down the class 3 section to the cave, he went straight down a very short section of steep rock in the low fifth class range. From the cave we retraced our steps down the wide gully, down to the two saddles and veered towards the north back to the approach wash and back to the cars by about 3:30 PM. We traveled about 8 miles round trip and gained 2,200 feet. Not too bad for a days work. Comparing the two climbs, Mopah's east face route was a better climb than the direct east ridge on Umpah. 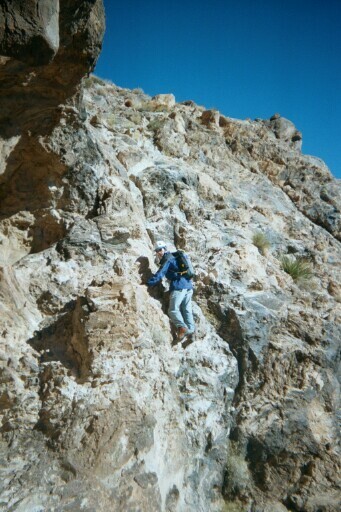 There was much less loose rock on Mopah than on Umpah's east ridge route and the rock quality was better than on Umpah. 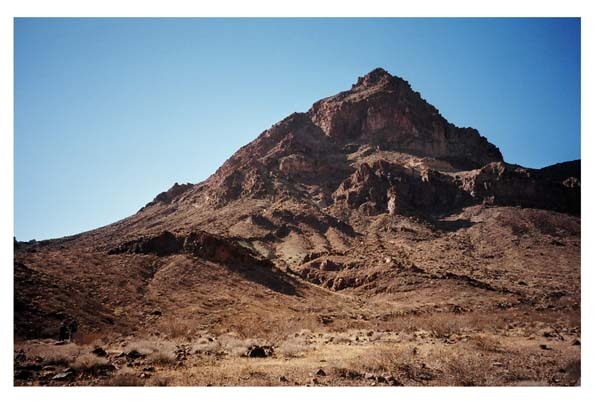 Mopah was a fun climb but a word of caution for Umpah is loose rock-it is a peak that requires some risk management. Thank you to John for driving out there in your truck and to Matt for leading and setting up the fixed line(which I recommend this method for climbing the crux on Mopah). That was an elegant lead by Matt on Mopah. 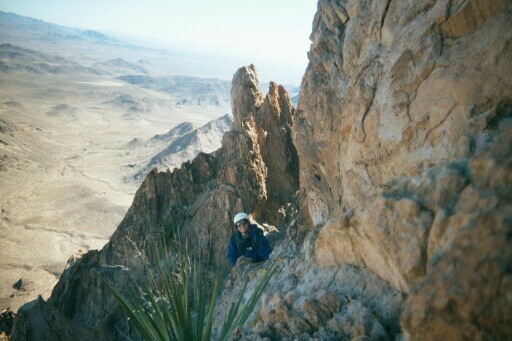 Matt Haynes climbing on the class 3 rock section from the cave on the East Face Route of Mopah Peak. Photo taken by John Paterson on 2/2/02. John Paterson climbing on a fixed line on the class 3 ledge after getting past the class 4 section from the notch. Photo taken by Matt Haynes on 2/2/02.